The success of your content marketing efforts depends on a few things. Understanding your audience is the first and foremost success factor. Then comes consistency, frequency, and auditing. They’re all impossible without thorough planning. That’s where you’ll need a proper media plan. In this article, we’ll focus on how to create a media plan. In addition, we’ll show you some basic media plan templates for different kinds of marketing activities and quick-overview some of the best media planning tools. But, first things first, let’s start with the media plan definition. What is a media plan? Generally speaking, a marketing media plan is a tool devised as a result of selecting the channels for content distribution and establishing its frequency. It exists as a visual aid to help content marketers implement their marketing strategy. The purpose of creating a media plan is to deliver the message to the target audience over the time and to determine the most effective ways of doing it. What is the difference between media plan and strategy? You don’t want to confuse media strategy with media plan. First of all, a media plan is based on your media strategy. A media strategy is a way you use different media to convey your message. Its purpose is to select the channels and decide on marketing activities needed to reach your marketing goals. Secondly, a media plan is the implementation your strategy over time. Its purpose is to assess and analyze the performance of the content across various media. In this sense, it’s more detailed than the strategy. Which channels do we use? How often do we publish? Which content do we create for each channel? How much money can we spend? All these are the step-by-step components of media planning, which we will overview below separately. These objectives need to be broadly defined, as we are talking about our long-term goals here. Goals should be more specific than the objectives. Besides, they must be measurable. We can set up goals for each of the marketing activities that we define later. Who are the people whose attention you hope to grab? You need to define your target audience’s demographic characteristics, along with their level of engagement and interests. If you are working with buyer personas, you’ll need to create multiple characters and describe who they are, what they do, and what needs they have. Owned media are channels that belong to your company, such as the website, blog, social profiles, etc. Earned media are channels that the company doesn’t own, but which can work in its favor. This is where your company is mentioned (niche blogs, other social media profiles, pages, and groups, forums, etc.). Paid media refers to platforms where you advertise your company for money. After you’ve defined your channels of distribution, it’s time to think about the content itself. Bear in mind that you must not limit yourself to text only. While it’s what that drives traffic to your website, also think about interactivity. Create visual content — images, videos, infographics. They are what gets shared across social media. Also, don’t forget about curated content: select and share third-party content from your industry’s established sources. Plan your content distribution. Decide on how often you will produce and share various types of content across all your channels. This will help you manage your time better and create consistency of updates from your brand. Assign the roles within your team. Who will be responsible for what? Remember to keep your plan in a centralized place, so that everyone has access to it and knows when to do what. An editorial calendar is the visualization of your marketing ventures throughout a specific period. It can be a media plan flow chart, where you list all your activities in the first column and the timeline in the upper row. Then, you choose colors for different types of content and fill your table with them. Another significant step in the media planning process is defining your budget. If your budget is flexible, you can include the planned budget column and the actual budget column in your marketing media plan. don’t post updates just for the sake of quantity. To give you some numbers, let’s consider social media. For example, while you can post on Twitter multiple times a day, several updates a week will suffice on LinkedIn. More of them will simply get lost in the feed. Let us get to the practical side if making a digital media planner. Below, you’ll find a media plan template for different marketing channels. With their help, you will learn how to create a social media plan, a PR media plan, the one for your advertising campaigns, the one for event promotion, and an editorial calendar. This tool will help your PR department organize their activities over time. Press releases, guest posts, and the company newsletter all go in here. A social media marketing team needs to post frequent updates. This is why it’s especially important to have all the social activities organized in one place. Below is a sample social media plan that you can use for your own purposes. By the way, if you want to grow your social media following, you might find these two articles useful: How To Grow Followers Of Your Facebook Business Page and How To Grow Followers Of Your LinkedIn Business Page. If you want to run an event, you would want to announce it in advance, post frequent reminders, publish content that will motivate people to attend it, and, of course, write about the event itself. Eventbrite has broken the event media planning into 4 stages: pre-event, event launch, day-to-day, and last call. When developing a media plan for events, it will be easier to create a spreadsheet with multiple tabs — one tab for each event. You can use flow chart for more convenience. You will need an editorial calendar for the content that your business publishes. Usually, it is everything that goes to your company’s blog, like in the example below. However, if you are doing guest posts on other blogs and websites, you can include them here too. Simply add a column “Platform” or “Website” next to “Author” or at the end. 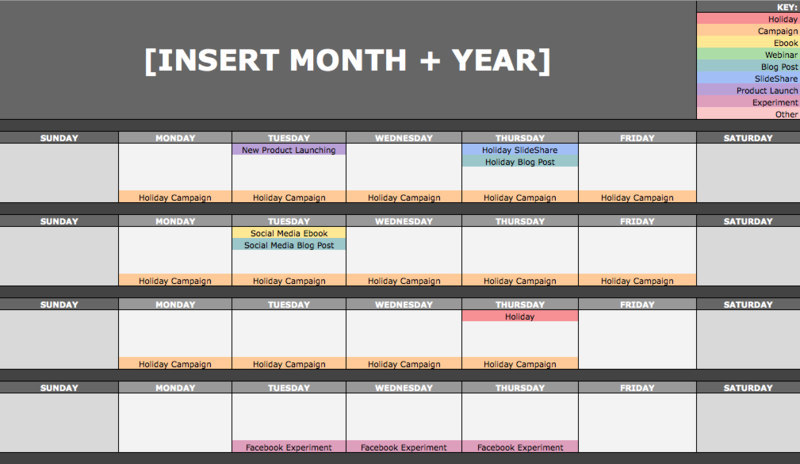 Creating a social media plan or an editorial calendar is an important yet probably the least time-consuming thing. What especially takes time is generating content and distributing it. Automating it with media planning tools will help you save lots of time. Let us look at some of the most popular tools for content planning and scheduling. It is a cross-channel scheduling tool for social media. You can add your social profiles or pages (up to 3 if you have a free subscription) to the dashboard and schedule updates either separately for each platform or all of them at once. With a paid subscription, you can schedule posts for a week in advance and even collaborate with colleagues. Buffer also creates tracking URLs for all your shared links and allows you to analyze their performance. While Buffer is the best scheduling tool due to its simplicity, HootSuite is perfect for managing all your social accounts on a single dashboard. You can even add your Facebook groups here. Like Buffer, HootSuite allows you to track the performance of your social media updates. If you have a budget to spend on social media marketing, then you can invest in Sprout Social, which is a platform for managing your social media accounts, leading conversations with followers and analyzing the results. It has some great features for monitoring keywords so that you can always have your hand on the pulse. While it comes at a cost, HubSpot has an arsenal of content marketing tools, such as social media management and automation, a blogging platform, built-in features to boost your SEO, and more. Careful and thorough planning of your marketing and PR activities will help you manage your time more effectively, remember the important dates, visualize the whole process, and analyze the impact of your work. Always have a general plan and more detailed separate plans for each of your activities. Use ready templates — they will help you save some time. And don’t forget about automation tools — with all the amount of content generated and online conversation going on, they are nowadays indispensable.